So a few weeks ago, I blogged about going to a strawberry festival in town, but had no strawberry pictures to show for it. Well the festival is over, but not the strawberries. I was able to get some local grown fresh strawberries from the market and have them for lunch this past weekend. As I was eating them, I thought to myself, "Am I drawing inspiration for this berry?" Why yes I am!" hehe. Do you see the Inspiration? 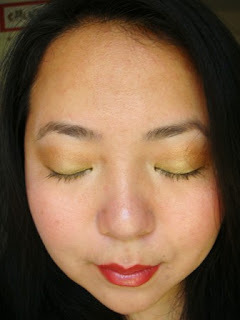 My inspiration for the FOTD, was from the *RED* of the strawberries, and the *Golds/Neutral* from the berry seeds. I hope you all see what I see and notice the colors I used. 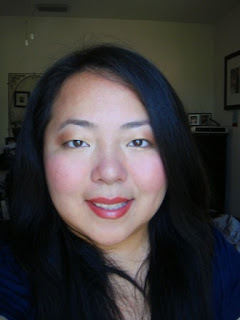 I was going to do a red eyeshadow look, but opted that out for red lips, since I haven't done a red lips fotd. "I love Spring. I love to drive by the fields and smell the sweet aroma of strawberries! YUMMY"
Thank you for leaving me such a sweet comment! I'm sure you are good w/nail color :p I usually smudge mine too! especially with darker colors. OMG now I really want strawberries! Nice blog, will be here again! love the makeup and i LOVE strawberries! Thanks! girls! love the comments! Such sweet makeup! :D I love the vibrancy of colors! 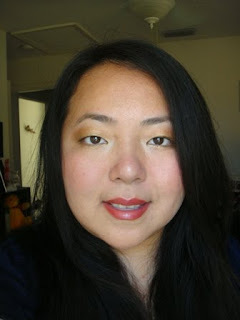 More FOTD plx! i luv strawberries too! sour & sweet soo refreshing! good FOTD photos...hehe seeds for the eyes !